Hendry, Phoebe. “Poets.” Little Things on Life’s Highway: A Book of Poems (Author, n.d.): 15. Poking about my files, I found this poem by Phoebe Hendry. As it is in my Canadian Poets” folder, I assume that at one point I had evidence she was, in fact, Canadian. Now, though, I have no information whatsoever—except that she was born Phoebe Locheed and was the wife of Hugh Hendry—and the only online presence she has appears to be the Internet Archive digital version of her collection of poems, Little Things on Life’s Highway. So if anyone knows anything else about this poet, we would love to hear! A number of details imply a Canadian connection: one poem refers to the Saugeen River and another to the Humber River, both of which are in Ontario, and the book is at the U of Toronto library. 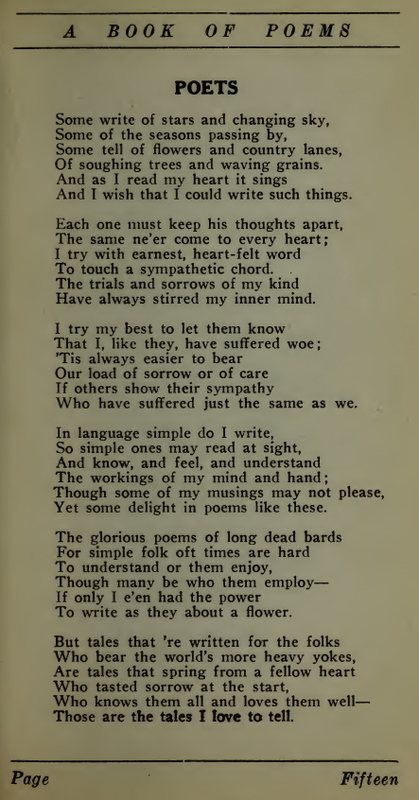 I see that one poem is dated 1923. But that’s not getting very far …..